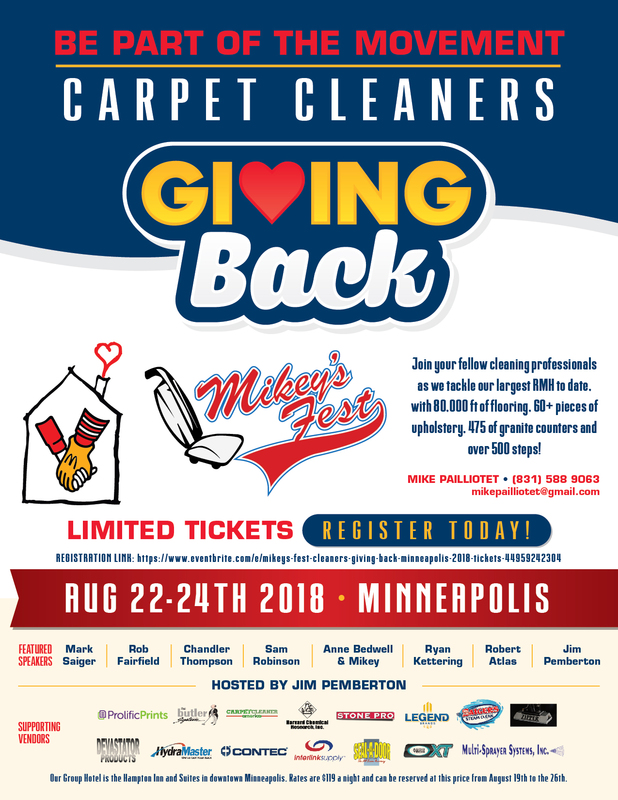 Mikey’s Fest Minneapolis-Cleaners Giving Back! 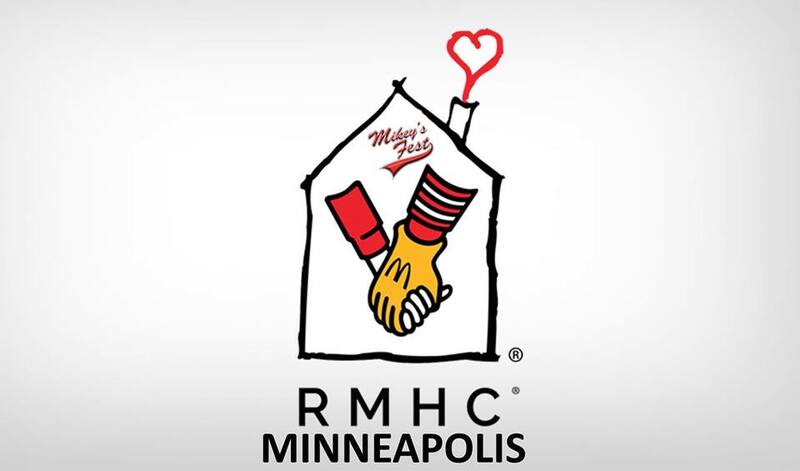 Home/Events/Mikey’s Fest Minneapolis-Cleaners Giving Back! will be giving a lecture on navigating the legal side of things while being a super hero sofa cleaner. Mark Saiger will present on how to make the most of your family ran cleaning business with style. Stone Pro’s Rob Fairfield will lead a class on restoring Granite counter tops. Chandler Thompson will present on how he rose to the top of the most competitive carpet cleaning market I the Unites States. Sam Robinson of house call pro will be presenting on how to leverage the marketing features of your CRM/Software. HydraMaster’s Steve Polous, Debbie with Aztec on “How to build your Fleet”, Anne Badwell with Pro’s Choice and the “Outlaw Biker” Bob Vawter will be here to share their expertise. We’ll be discussing the day’s schedule as well as our game plan for the RMH Cleaning. It’s not everyone who will tell you without hesitation, all that it took to make them a success. Don’t miss out on this rare opportunity to learn from Mark’s successes and failures as a multi generation cleaning nerd family member. If your goal is to keep your cleaning business small, efficient and profitable, come learn from the master! Brothers Kirk and Dave will be on hand to share as well. 10 :00 to 11:00 –Sam Robinson, world leading expert on Customer Relationship Management software. If you’re still running your business out of a notebook and a floppy disc, it’s time to jump into the next century and learn about the multitudes of software options and how to best use built in, virtually free features to make your phone ring with loyal happy clients. 1:00-2pm Chandler Thompson, not your everyday joe. Much like Mark Saiger but in the super crowded, hyper competitive market of Atlanta, learn from a super star how he rose above the masses of mundane cleaners and became the go to guy for the elite homeowners in his area. A rare opportunity to learn from a millennial cleaner killing it in the trenches TODAY and not twenty years ago. 2:00-3:00 Ryan Kettering, the man on the scene. If there is a more in touch graphics designer for our industry, I dare you to find him. Ryan is going to tell you how plug your leaky bucket, quit loosing your valued customers by creating a better in home and online experience for your happy and loyal customer. Detroit’s most infamous Owner Operator spills his guts about his crazy life of outlaw bikers, hot tubs filled with girls, drag racing, cigarette boats, the Purple Flame and how he made and lost a fortune cleaning carpet with a $49 job average. It’s all hands on deck as we learn handy techniques to improve the appearance of synthetic upholstery in minutes. Using encapsulation and other low moisture tricks along with your truck mount, you’ll be able to keep your customers who are on a tight budget, happy and loyal while adding to your bottom line every day. Great knowledge for your commissioned technicians who rely on upselling to earn a living wage. You’ll be able to practice these skills at the RMH on Thursday on over 60 pieces of upholstery. 11am to 1:00pm– Robert Atlas –Quick and easy carpet repair skills. Nothing makes a client happier and more loyal than if you can restore, clean and seal their granite, tile or synthetic countertops after you’re done with their carpet. By the time we’re finished with the RMH’s 475 feel of counters, you’ll be an expert in hard water deposit removal, deep cleaning, polishing and re-caulking. Practice your skills with Rob in this down and dirty session. Don’t wear nice clothes, or bring an apron. 3pm to 4pm– Mike Pailliotet, Contec’s Ann Heinke Bedwell and Mark Saiger– Quick and ridiculously easy tile, stone and LVP cleaning and sealing. If you want happy and loyal clients you better figure out how to clean and seal their hard surface flooring for the same price you clean their carpets for.. As carpet continues to decline in popularity NOW is the time to learn how to speed up your processes. Practice for the acres of flooring at the RMH with new equipment and chemicals designed just for this purpose. * expect a change or addition two..
By Barker-Hammer|2018-07-03T13:30:14+00:00May 23rd, 2018|Events|Comments Off on Mikey’s Fest Minneapolis-Cleaners Giving Back!